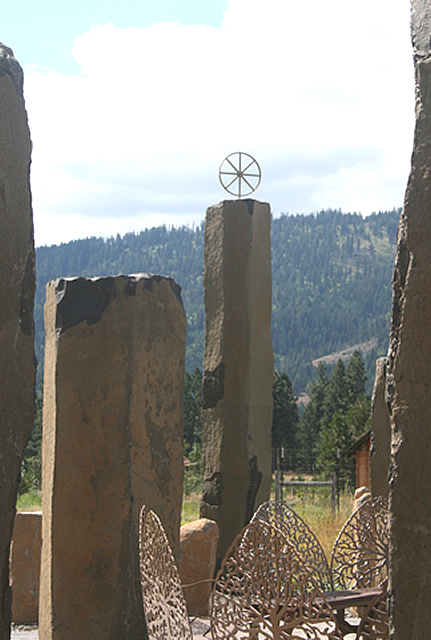 The White Mountain Temple Complex currently consists of the Sanctuary, and the Stone Circle. The plan for the future is to add altars and shrines, temples, an ancestor mound, and more gardens to the area, making a druidic temple complex. 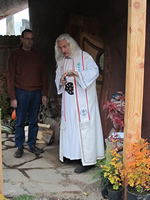 Our vision for this complex is to use it as a monastic ritual site, though many, if not most, rites would be open to the public. We see us celebrating the High Days on weekends for the public and on the actual day for ourselves.WeI also see celebrations of the Druid Moon (the sixth night of the New Moon as mentioned by Pliny the Elder in his Natural History), civic holidays, healing rites, magical rites, ecstatic rites, and daily devotional rites. 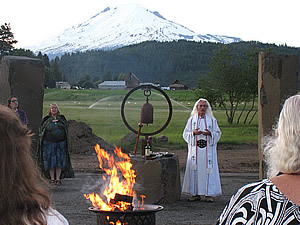 It is part of our dream to see the White Mountain Druid Sanctuary become a place of prilgrimage for Pagans everywhere. Currently we am celebrating public High Days, either in the Sanctuary in winter and bad weather or in the Stone Circle when the weather is good. And we are starting to get good turnouts for the summer rites in the Circle. We've had as many as 60 people attend. The climate here in Trout Lake is somewhat more severe than in Tucson, and outdoor public rituals really aren't practical for half of the year. However, we do foresee holding some winter rites for the monastery outside in a snowy stone circle, around a huge bonfire. 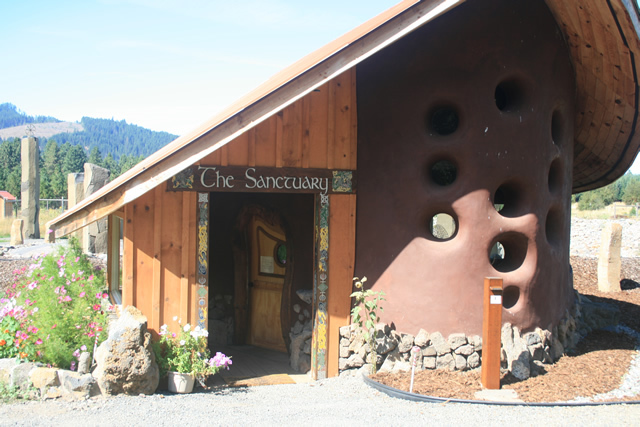 The Sanctuary is a building made with cob, which is essentially clay, sand, straw, water, and earth, similar to adobe. It has a foundation made up of volcanic stone from the property, and also has a set of three windows on the north side that face Pahto (Mt. Adams). The floor is pounded clay, coated with linseed oil (something that needs to be renewed every few years). And both the exterior and interior surfaces are made up of colored clay washes. 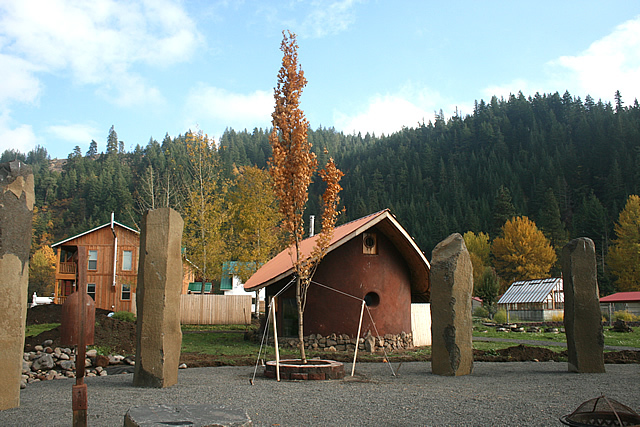 This building was constructed by the former owner of the property as a Judeo-Buddhist retreat house. There is a small fireplace in the east wall that is built within a sculpted tree. This tree flows from floor to ceiling, and is one of the main reasons I found myself so attracted to this location. At the west end of the building, from the door around to the windows, is a cob bench covered with pillows for congregants to sit on. There is a round window on the west wall, and I have placed the well, a copy of the Gundestrap Cauldron, on the bench beneath it. As one can see from the photo above, the Sanctuary has an unusual roof line. Indeed, some locals refer to it as the 'taco house'. But this roof was erected first, on poles, and the walls then were built up to meet it. Inside, the ceiling is curved, like the underside of a boat, and is both striking and beautiful. We have recently brought water and power to the building, and we have installed ceiling lights for dark afternoons and evenings, as well as an electric heater, to make use of the building more practical. We also plan to carpet the earthen floor for warmth - winters can get quite cold in Trout Lake. At my first Winter Solstice ritual here, my offering of beer froze in the horn before I could pour it out on the ground for the Outdwellers. The entry to the Temple Complex is first past an altar to the Outdwellers and then over a small stream between the same two granite pillars that we had in Tucson (and brought with me here) with the carving of the Newgrange spirals on each stone. From here, the path curves around past the Sanctuary, along the southern end of the temple area, and then around the stone circle, entering it on the west side. While digging the holes for the stones, we discovered that half of the circle is on dry land and half of it is on land which becomes a swamp in the winter. How very liminal! 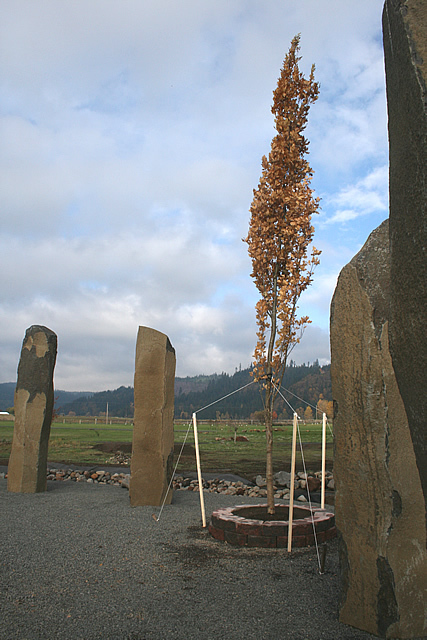 Interestingly, the Well/Shaft is in the wet (western) half, and the oak tree is in the dry (eastern) half. 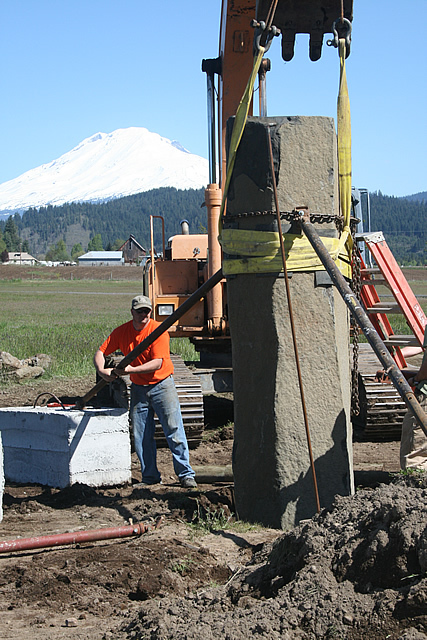 This swamp tendency required us to have an engineer design the footings for the stones. We had originally planned to just plop them into holes in the ground, but had we done this, the stones in the wet half would have simply toppled over, or even disappeared over time. We have nothing but great respect for those folks who build stone circles and raise stones the old fashioned way - with levers and piles of dirt and human labor. I'm a bit old for that, though, and wanted them up in time for the Eight Winds Festival, ADF, held at the Abbey in June of 2010, so I resorted to hired men and machinery (right). 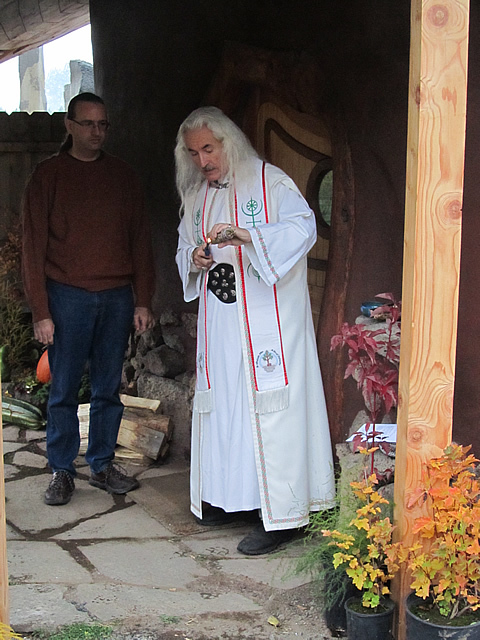 Just as we had done in Tucson, for this new circle of standing stones we made another pilgrimage to Ireland, England, and Wales to collect small stones from near sacred sites to connect our standing stones to the magic of the ancient world. We found some simple, round, metal boxes that we could use as reliquaries to hold the pebbles, and assigned those small stones from sacred sites to each of the large standing stones we were erecting. As each big stone went into the ground, I placed a reliquary with sacred pebbles under each stone before the final pouring of concrete. Thus this circle is connected to sacred Celtia. There is a map of the Stone Circle showing which pebbles went under what stone. 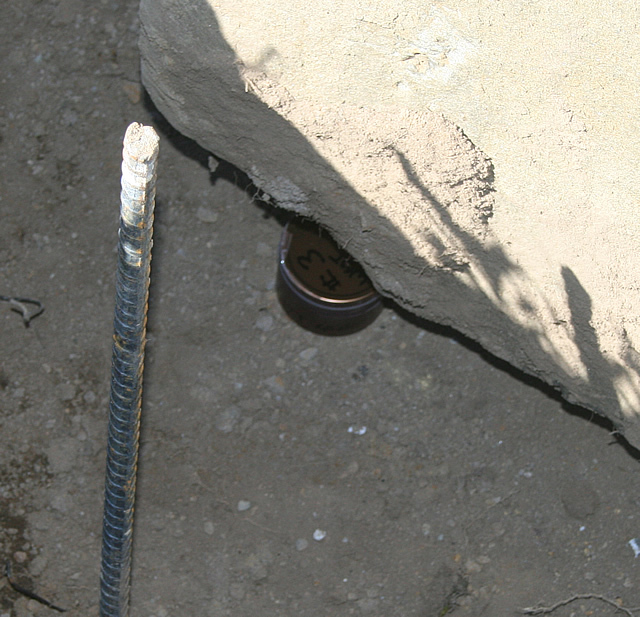 We did dig a shaft for offerings that is 3 feet across and fifteen feet deep, and lined with a plastic culvert. From this humble beginning it was faced with stone and given it a lid, and attached to it, facing the center of the circle, is a stone bowl which is used for the Sacred Well. 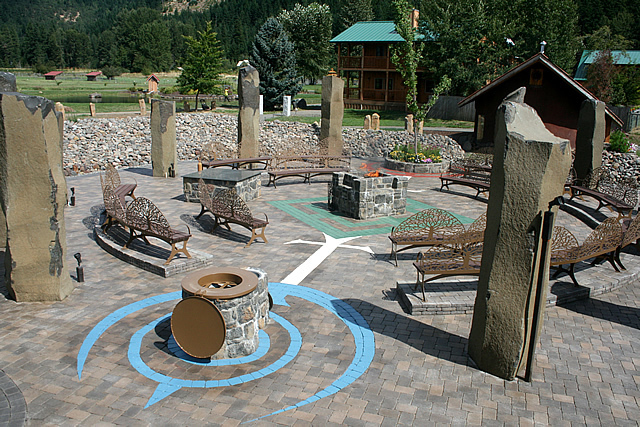 At the center of the circle is a stone lined fire pit four feet across and raised up above the ground three feet. This is big enough to build quite a nice bonfire, especially at Samhain, and high enough that smoke usually goes over the heads of the congregation. The Sacred Fire also has ledges where offerings can be put before they are given to the flames. There is a large stone table in the north, useful for displaying offerings, and an oak tree was planted at the east side of the circle. This was not successful, however, and a 25 foot-long juniper pole was carbed with the Cosmos Sigil and this has replaced the tree. In addition to representing the Axis Mundi when Pahto is not visible, it will also continue to be used as a place for offerings to the Spirits of the Land. There are already a number of necklaces and pendents hanging from it. 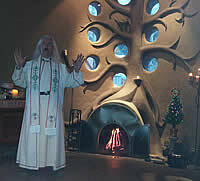 The Circle has also been paved, and colored pavers were used to put the Cosmos Sigil on the ground, with the Well in the center of the Underworld portion of the sigil, the Fire in the center of the Midworld portion, and the Axis Mundi in the Heavens portion. To make the sigil stand out more, it was stained with colored concrete stain and then the entire paved area was sealed. As is usual in all Indo-European sacred spaces, there is a clearly marked boundary for the circle. A ditch was dug (which also drains the area towards the drainage ditch to the west of the circle) around the outside of the stone circle, and it has been lined with rocks, with a boundary mound on the outside of the ditch. In the archeology of northern Europe, boundary mounds on the inside of ditches were made for defensive reasons. Those with their mounds outside the ditches were built for sacred purposes. In time, the entire temple complex area will be marked with a clear boundary. 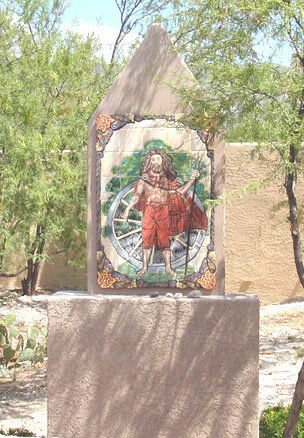 Back in Tucson in 2002, when we first did a public rite in that stone circle, the weather looked very threatening, and so I made a votive offering to Taranis, Lord of Storms, that I would build Him an altar if He would only give us good weather for that evening. 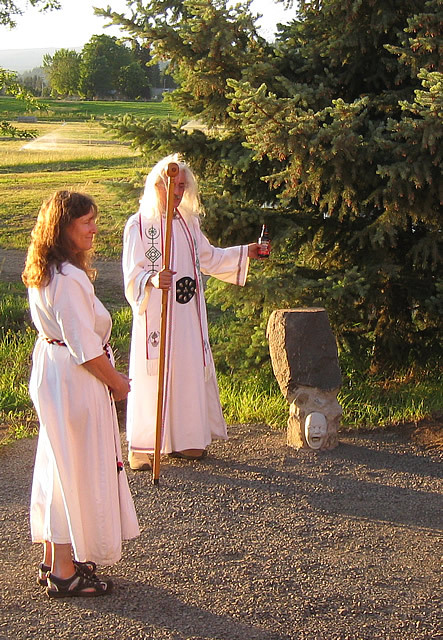 During the rite that night, as we opened the Gates to the Otherworlds, the sun slid out from under the clouds, lighting up the Rincon Mountains, with a rainbow crossing the sky, and with birds flying around the circle of stones. Well, He got his altar. But since I had taken it down when we moved, I felt obligated to put up another one as soon as I could. When searching for the stones we would need to build the circle, we ran across one that was 23 feet long, far larger than all the others we had found. 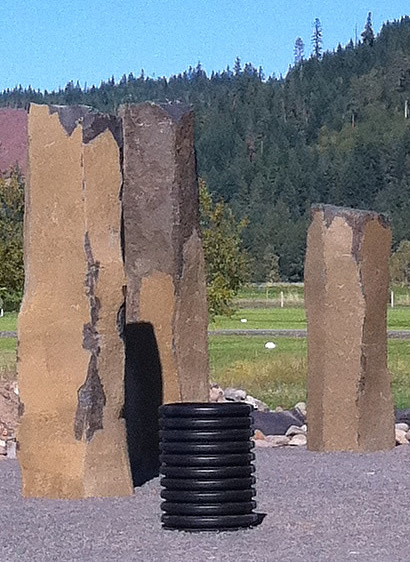 This stone, we determined, would become the Taranis Column (similar to the Jupiter Columns of the Rhineland area). My friend Marv, in Las Vegas, located a large, metal, 8-spoked wheel for us, and this we had powder coated in a gold color. It now is fixed to the top of the stone (above). The plan is to build a shrine next to this stone to hold the icon of Taranis that we had made back in Tucson. Only here it will get a small cantilevered roof to keep the snow off in the winter. 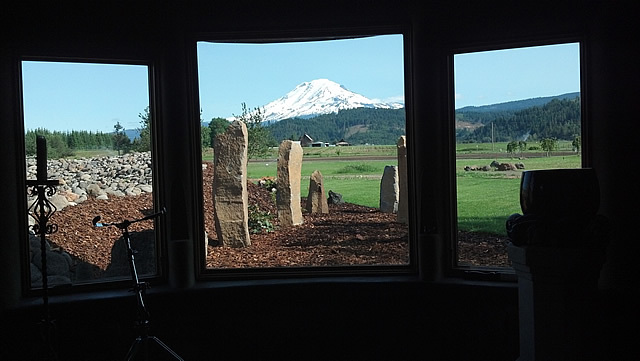 The Stone Circle and the Sanctuary nestle close together. As more and more altars and temples are added, and plantings are added and grow, the complex should begin to come together more completely as a unity. There is a small pond to the west of the circle, and in the northwest will be an Ancestors Mound, which will also serve as a storage place for the apples we grow and harvest at the Abbey.We plan to put a seat at the top of the mound, where, as in Arberth in The Mabinogi, 'wonders' may be seen while in trance. To the north of the Sanctuaryis a small lawn with a place in the center where the Maypole is placed and used at Beltane.